The fifth annual Rock Creek Extreme Cleanup will take place on Saturday, April 6, from 9 am to 12 pm. 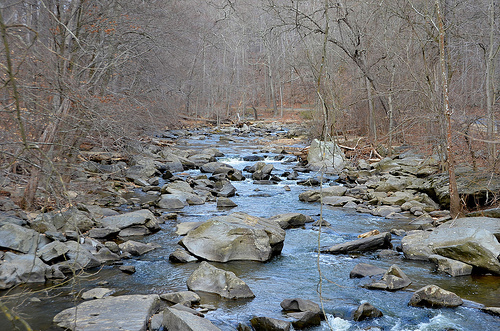 Rock Creek Conservancy is seeking volunteers to remove trash and debris at over 70 locations along Rock Creek in Washington, DC, and Montgomery County, MD. Click here for a map of cleanup locations and signup information. The three-hour cleanup will bring together kids, families, and adults of all ages to pick up litter from the creek and woodlands. People interested in volunteering can find a cleanup location and sign up at the Rock Creek Conservancy website, rockcreekconservancy.org. During each of the past four years, volunteers have fanned out in parks bordering the 33-mile length of Rock Creek and collected over 2,500 bags of litter and tons of assorted junk, including a Canadian flag on a flagpole, a parking meter full of coins, and a Vespa motorbike. During the Rock Creek Extreme Cleanup, volunteers carrying colorful trash bags can be seen for miles in Rock Creek parks.